To visit the Sydney Swans website click the logo below. I was born into a Bloods family, my great uncle Jim Caldwell captaining our Premiership team in 1918. My red and white adventure began at my first game at Lake Oval, in South Melbourne, when I was not yet five. I became a Swan for life. That was in 1948 – 67 years ago – and my devotion to the red and white has never waned. 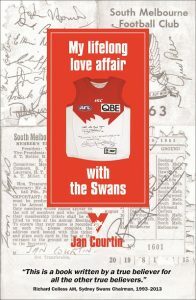 My book “My Lifelong Love Affair with the Swans” grew out of my weekly articles published on Footy Almanac in 2015, which include memories of the South Melbourne days and the childhood passion for my team, the frustrating teenage years of change and rebellion and when South rarely won a game, the heartache and tumultuous years that culminated in the club’s wrenching move to Sydney in 1982, and the successful years since 1996. I also describe my sadness and the tears shed for our unloving country in its treatment of Swans champion, Adam Goodes, in 2015. The book intertwines a 72-year life’s journey with the love of a footy team, encompassing passion, dedication and perseverance – from Melbourne to London to Brisbane, and eventually to Sydney to be closer to my beloved Swans. It is not a history of our great club – although references have been made to many games and events – but a story involving family, rebellion, travel, love affairs, political awareness, sadness, happiness, joy – and the one constant: my love of the red and the white. Richard Colless AM, Sydney Swans Chairman 1993-2103, has very kindly written the Foreword. He and Andrew Ireland, CEO of the Swans, have also very kindly offered to launch the book at the Swans headquarters in Sydney on August 31st. I was flattered beyond belief when the author asked me if I would write the Foreword to this book. There have been many books written about the Swans, or where the club was a significant part of the narrative. From 1982, according to my calculations, there have been well over 30 published. They cover a wide range of themes, such as the various tomes on the club’s history from 1874 up until the present day; the relocation of South Melbourne to Sydney; significant events; defining moments; autobiographies and biographies of players and coaches, personal development advice, and two children’s stories!! All have provided unique insights – from an extraordinary range of vantage points – into the great institution that is the Sydney Swans. Jan Courtin is the latest wordsmith to join this group. Her beautifully crafted book My Lifelong Love Affair with the Swans doesn’t easily fit into any of the above genres. Its category really is “Inside the Mind and Heart of the True Believer”. And a true believer Jan certainly is. Her love affair with the club starts in Melbourne, takes us to London, Brisbane and Sydney and virtually every ground in the country at which the Swans have done their thing. It is punctuated by three recurring strands. Family. Friends. Footballers. We travel from half way across the world with her to see her beloved club play in its first final in two and a half decades. And share the pain of losing by 53 points in front of 105,000 people. We share with her the sense of expectation in 1996 when her team finishes top of the ladder and the sense of disappointment when it is comprehensively beaten in the Grand Final. And we relive her sense of ecstasy with the breaking of a 72-year drought when the club wins the Premiership in 2005. It’s interesting to note that Jan’s great uncle Jim Caldwell missed playing in the 1909 premiership side due to suspension and had to wait an agonising nine years before he tasted premiership success as captain of the club in 1918. Exactly the same period of time Jan had to wait between the loss of ‘96 and the victory of 2005. True believers are essentially romantics. Jan lovingly paints pictures of players who she never saw but who were eulogised by her family, to those who are etched in her memory as a little girl growing up in a red and white family, through to the players of today. True believers understand that it’s all about players and the team. This is not a book about football politics or the game as a business. True believers are eternal optimists who can always see the proverbial ray of sunshine in the middle of a hailstorm. Even when their beloved team is relocated to a foreign environment. Or they are living on the other side of the globe. Their passion for the deeds of yesteryear is only exceeded by their dream of what lies in the future. Without the true believers our club and the game as a whole would have little meaning. This is a book written by a true believer for all the other true believers. It is a singularly welcome addition to the rich trove of Swans’ history and culture. If you would like buy a book it can be bought via the “Purchase Book” link on the website. Almanac members receive the same discount as Swans members. Choose the “Sydney Swans Members” option on the drop down Menu if paying by credit card or PayPal. If paying by direct debit or cheque the same price of $20 + $6 postage will apply. No extra postage if more than one copy required. 10% from the sale of each book will be donated to GO Foundation, a charitable organisation set up by Adam Goodes and Michael O’Loughlin to provide Indigenous children with scholarships to quality schools. Congratulations Jan. A mighty effort – both the lifetime of supporting the Bloods and sticking through to the end with this project. Always worthy of a celebration. All the best with it. Good luck Jan. Its a great project I loved your stories and I know Almanac readers will also enjoy them. Many thanks John and Dave, and Robina. Won’t be getting the digital version yet Robina. I’m not sure that the comment from paubai is supposed to be on this posting, but I certainly concur with the sentiments. Congrats Jan. I love your passion,verve and loyalty. Uncle Jim played in a Premiership against Collingwood. Does that help you dislike us a little less? Well done. Magnificent work. Will be ordering my copy today. Can you sign if for me please??? Sorry, Phil, it doesn’t help! and Yvette, many thanks to you too. I will certainly sign it for you. Wow! Congratulations on your publish. Your club has been strong thanks to you, a loyal supporter. As my Saints haven’t won the flag for 50 years, I need to be strong and loyal, like you. It’s a great news for all of us Almanackers. I hope I can write a book in English! That’s a mighty achievement, in anyone’s colours. I can’t wait to read your book Jan. Congratulations! It’s all a bit of an unknown at the moment, so I’m just trying to relax and “enjoy the ride”. Not too good at relaxing, mind you! Hopefully, with the amazing involvement from the Swans, footy fans out there will buy a book, and, I hope, enjoy it! A great review by Keiran, Jan. Your book would be the perfect gift for any Swans fan, whether new to the game or a diehard. Congrats on the book, Jan. I really look forward to reading it. Tomorrow is the big day at the Swans, for the launch! it was an honour to attend your book launch yesterday and what a wonderful book! I couldn’t stop reading and finished it around 1 am last night! I recall Bruce Springsteen saying in an interview once that he felt the role of a songwriter was to trigger a memory or time in the listener that took them back to that moment. He does it for me in particular in the opening lines of his song My Hometown; “I was 8 years old running with a dime in my hand…to the bus stop to pick up a paper for my old man”. I’ve listened to that song a thousand times (maybe less) and it always brings a tear to my eyes. Every Saturday evening during the footy season I would run to the Milk Bar starting at around 6:30pm to see if the Sporting Globe had arrived, if it hadn’t I’d go home, wait 15 minutes and go back again – I wanted to be home in time to watch the footy replay. Your book had me laughing out loud “it was not healthy to always go around with the same girl”, the occasional tear and moments of sheer joy. Zac was on my shoulders when Nick Davis kicked that goal and I jumped for joy – he would have fallen off but the crowd was so tight someone else caught him! I too remember Zac and I leaving the MCG after the GF in 2005 when one of his teachers, who had had too much to drink” came rushing up to us and gave us a big hug – I had no idea who she was but it didn’t matter, I just hugged her back. I could go on, but it’s the early years of your life that made for the best reading. Saturdays at Windy Hill, or wherever the Bombers were playing, with Dad – except Kardinia Park and the Western Oval. If Dad couldn’t make it I would watch South’s with my Grandmother. You were very lucky to have a Malvern Star and I’m very lucky to have read your book, it’s not just about your love of the Swans it’s a memoir of; life in Melbourne, the beginnings of non white equality (we still have a very long way to go) and for me a chance to feel like I am sitting with my Grandmother all those years ago. By Bruce Springsteen’s reckoning you have fulfilled the role of a story teller in many ways. Well done, go the Swans ! Donna McGrath on Round 5 – Richmond v Sydney: Go the Mighty Bloods – I love you, win or lose!